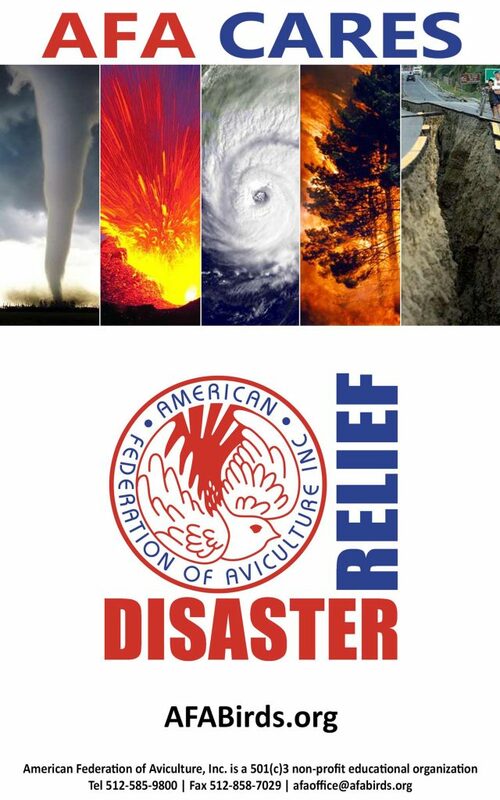 The AFA Disaster Relief Team is comprised of Regional Directors and others who are located throughout the United States. This expedites response times and notifies local volunteers who are monitoring the weather conditions as the need arises in their immediate areas. If you are in a disaster area needing assistance with your birds or know of anyone in need of help with their birds, reach out to our disaster relief team here! Rescue only those birds whose life is threatened. Solicit experienced bird handlers to help with the rescue. The American Federation of Aviculture is ready to try to locate help for you. Call the American Federation of Aviculture’s office at 512-585-9800 orafaoffice@afabirds.org.